1920s and vintage themed weddings have never been so popular. From the hugely successful remake of The Great Gatsby to Kris Jenner’s recent 60th birthday party, the glitz and glamour of the 1920s is hugely on trend at the moment! As well as films and parties, we’ve seen a real rise in the number of vintage and 1920s themed weddings too. The roaring 1920s provide the perfect backdrop for your beautiful day – but we’re sure there’ll be lots of planning required in order to recreate the feel of a decade! One of the best ways of letting your guests know about your wedding theme is through art deco invitations. There are lots of great options on the market and sending stationery which bears the iconic art deco style will highlight to your guests that there’s a 1920s themed wedding party coming up! One of the perks of hosting a 1920s themed wedding is that those attending your big day can join in the fun too. Why not invite your guests to help you recreate the 1920s by setting a vintage dress code? For ladies this could be anything from an opulent head dress to an all-out flapper style sequin gown. Male guests can also don their best three piece suits or tweed accessories to ensure they look the part. 1920’s table names will get your guests talking as they take their seats. Some of our favourites are The Great Gatsby, Al Capone and The Charleston. And what about a Prohibition table for those alcohol loving guests? Jazz music is an iconic part of the 1920s and the right music will complete your themed wedding. Every good wedding involves lots of dancing and what better way to get your guests on the dancefloor than with a live jazz or swing band? Silk Street Swing are a sharply dressed, professional jazz and swing band who specialise in 1920s events. Silk Street perform at weddings of all shapes and sizes and understand that hiring a jazz band shouldn’t cost you the earth. We offer a range of line-ups to suit both your budget and your event and can also offer acoustic options too. When it comes to your playlist, Silk Street Swing will happily offer a wide range from classic swing tunes through the jazz songs with a modern twist. 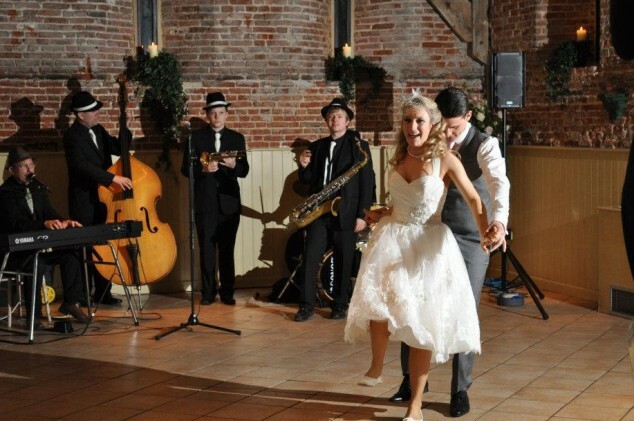 If you’re planning a vintage themed wedding and want that big band experience, we’d love to speak to you about how we can help, so please get in touch today or complete our quote request form. If you’re looking for something a little different for your 1920s themed wedding, why not check out our other bands Silk Street Jazz and the Jazz Spivs?